We at the Secretariat are are happy to announce that we recently published a new booklet and annual report for FY2016, and, looking forward, we are already beginning our preparations for CBD SBSTTA-21 in December of this year. We would also like to let you know that the summary report of the Satoyama Initiative Regional Workshop in Sabah, Malaysia has been completed, including abstracts of all presentations given at the workshop. Regarding events, we have an announcement of an upcoming Public Forum on Biocultural Diversity, and a report from a recent workshop on gender mainstreaming, both held here in Japan. 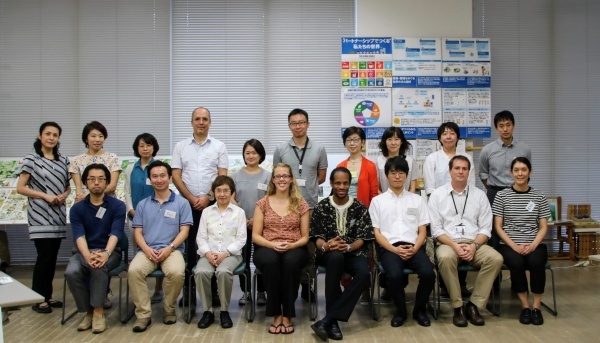 We are also sharing the latest newsletters from two of IPSI’s most important Collaborative Activities, the COMDEKS programme, and the “GEF-Satoyama Project”. The IPSI Secretariat is looking forward to sending staff members to Montreal, Canada for the Convention on Biological Diversity’s Twenty-first Meeting of the Subsidiary Body on Scientific, Technical and Technological Advice (SBSTTA-21) from 11 to 14 December. We look forward to providing support to all of our members who are parties to the Convention and also to seeing friends from the IPSI community. This meeting will also be held back-to-back with the Tenth Meeting of the Ad Hoc Open-ended Working Group on Article 8(j) and Related Provisions of the Convention (WG8J-10). 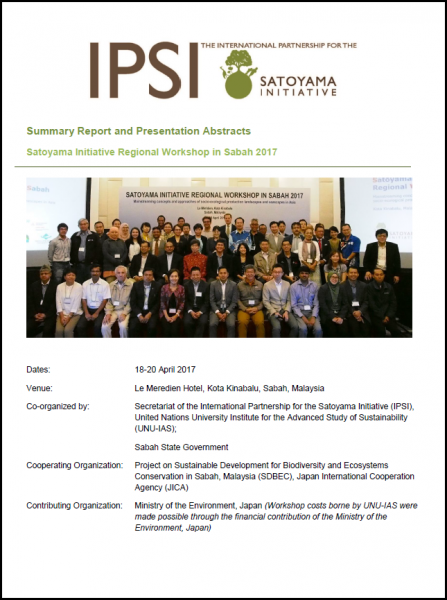 The summary report and collected presentation abstracts for the recent Satoyama Initiative Regional Workshop in Sabah, Malaysia, held in April 2017 in Kota Kinabalu, has been completed and is now available for download here. The report contains abstracts of all presentations given during the workshop, as well as a great deal of other information about the workshop, including outcomes and lessons learned. More information about the event is available on the event announcement page here. A “Public Forum on Biocultural Diversity” is scheduled to be held at 14:00-17:00 on 4 October 2017 in Kanazawa Bunka Hall in Kanazawa, Ishikawa Prefecture, Japan, organized by the United Nations University Institute for the Advanced Study of Sustainability’s Operating Unit Ishikawa-Kanazawa (UNU-IAS OUIK) and the IPSI Secretariat, with support from the Ishikawa Prefectural Government and the Hokkoku Shimbun newspaper company. The Forum is being held as a part of a series organized by UNU-IAS OUIK to commemorate last year’s 1st Asian Conference on Biocultural Diversity, and will have the title “Biocultural Diversity & Satoyama – Learning about Worldwide Efforts towards Societies in Harmony with Nature”. Members of the IPSI Steering Committee will be in Kanazawa at that time for a Steering Commitee meeting, and its Chair, Prof. Alfred Oteng-Yeboah, will give a keynote address, and members Dr. Senka Barudanovic and Dr. Anil Kumar will also present and take part in the panel discussion at the Forum. This will be an excellent opportunity for participants to learn about and discuss issues related to promoting biocultural diversity, including the Satoyama Initiative and IPSI’s role. Any readers who are able to attend are encouraged to do so. Please see the UNU-IAS OUIK website here for more information and registration information. A workshop on gender mainstreaming was held on 6-8 September 2017 at the United Nations University Headquarters building in Tokyo, Japan, organized by Conservation International Japan under the “GEF-Satoyama Project“. Members of the IPSI Secretariat staff and other IPSI members attended to learn about various issues surrounding gender and how to incorporate it into project implementation. The workshop was facilitated by Ms. Whitney Anderson, Conservation International’s gender focal point for the Asia-Pacific region. For more information on the workshop and the GEF-Satoyama Project in general, please see its website here. 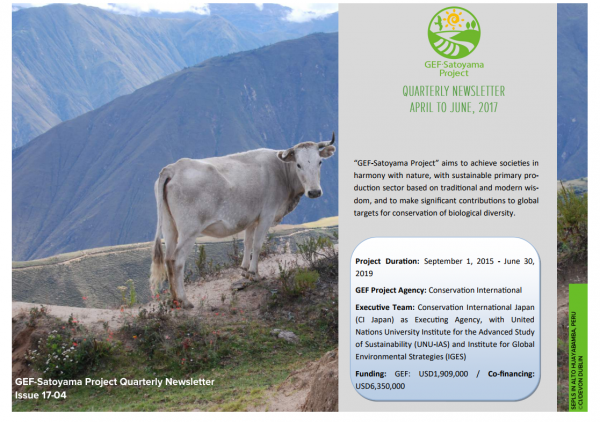 The GEF-Satoyama Project recently produced its third quarterly newsletter, including a report of the GEF-Satoyama side event at the Satoyama Initiative Regional Workshop in Sabah, Malaysiain April 2017, and progress in implementation by partners in the field.